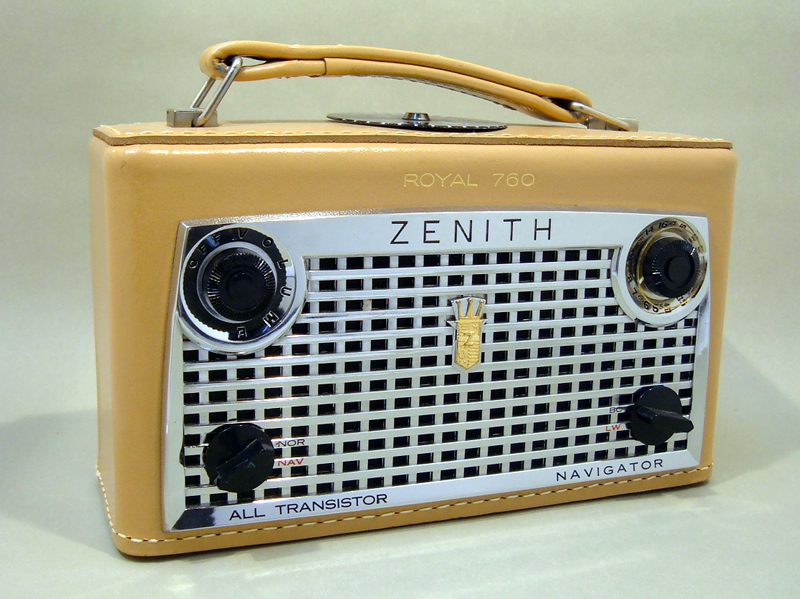 One month after the introduction of the first Royal 500 hand-wired radio, Zenith introduced their first portable transistor radio. It was called the Royal 800. The Royal 800 was a lunch box sized nylon cabinet portable radio that had a pop-up handle on top that also served as the antenna. The Royal 800 really packs a punch. It is powered by 8 “C” size batteries and has a large 4″ front speaker, seven transistors, and undistorted output of 500 milliwatts (5 times the Royal 500). The Royal 800 was a radio that was ahead of it’s time. Zenith made the Royal 800 in Black and also a scarce grey version. They sold for $89.95 and in my opinion, that was a lot of performance for the price. But the popularity of the smaller Royal 500 led to the 800’s short life and limited production. This makes them quite a find today for the collector. The Royal 800 was soon replaced by two leather portables in 1957; the Royal 700 and Royal 750. The change to leather was a trend that would continue as Zenith produced several other leather lunch box sized portables over the next few years. In 1958, they introduced the first Navigator with the Royal 760. 1959 saw the Royal 675 “Independence” and the Royal 710 “Yorktown” from the Americana series, as well as the Royal 755’s. In 1961, the Royal 650 was introduced along with a redesigned Royal 675, 710, and yes, another Navigator; the Royal 790 Super Navigator. Of all the portables Zenith made, I like the earliest ones the best because of their styling. Their grills look like they were patterned after the cars at that time. Check out these Portable Transistors radios. Hi Gary, this is Michael Jack here. I met you the other day at the Lansing EXTRAVAGANZA show. I’m the transistor radio collector from north of Toronto. By the way, you site, knowledge and collection is top notch! Nice to meet you. We’ll see you again next year! Again, thank you for the great 1000D. I lived in Caracas Venzuela from 1951 to 1959 since my father worked for United Geophysical located in Pasadina, California and Venezuela had a lot of oil exploration activity in the 1950s. 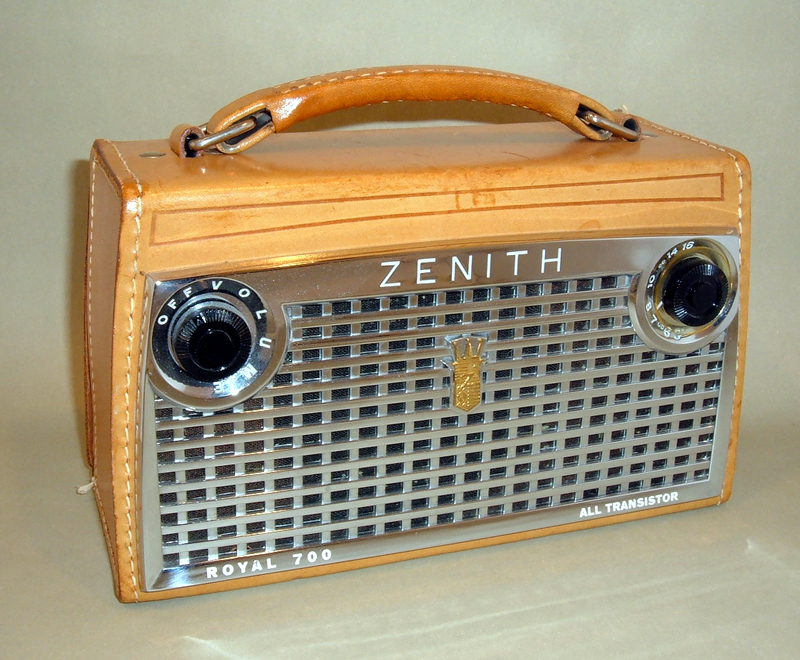 Around 1958 I conected my father’s Zenith Royal 500 to a long-wire antenna and pick-up stations in New York and Los Angeles, California at night. I was thrilled since I was born in Los Angeles and missed the place of my birth in 1939. Lots of reading and soldering lead to jobs as a Chief Engineer and happy retirement. Some day I would like to get my hands on a Royal 500 in good condition. Reliving your childhood is one of the nice activities of retirement. The 1000D was one of many fond memories. Lenny, I just obtained a Channel Master AM/SW radio that I can not get to work very well. I was wondering if you would like to try your magic on it? Let me know if you are interestd and we can discuss the arrangements. Hi, Gary. Robbay at Worthpoint suggested I contact you about a transistor radio I have. It’s a Zenith Royal 800, just like yours…same color scheme…not in as good condition as yours (which looks perfect) but mine doesn’t seem to have any major flaws, either. I haven’t tested it yet, and to be honest, besides putting batteries in it and turning it on, I’m not sure HOW to test it. Anyway, I’ve been having a heck of a time getting a bead on what it might be worth and where the best places are to post if for sale. I’m hoping you can help. I can send pictures, etc. if you like…and thanks in advance for your time. i have about 6 zenith royal 500s and only my blue gray works well so i decided to get them working again. i have had them along with many other transistors for many yrs. 20 plus. well i have known norm smith for many years and i saw him at a recent radio meet here in florida and he said that he will work on them for me. isnt that a stroke of luck. norm is very knowlagable and i could listen to him talk about transistors for hrs. I’m looking for Zenith Royal 880 knobs. Can you point me to where to get them? 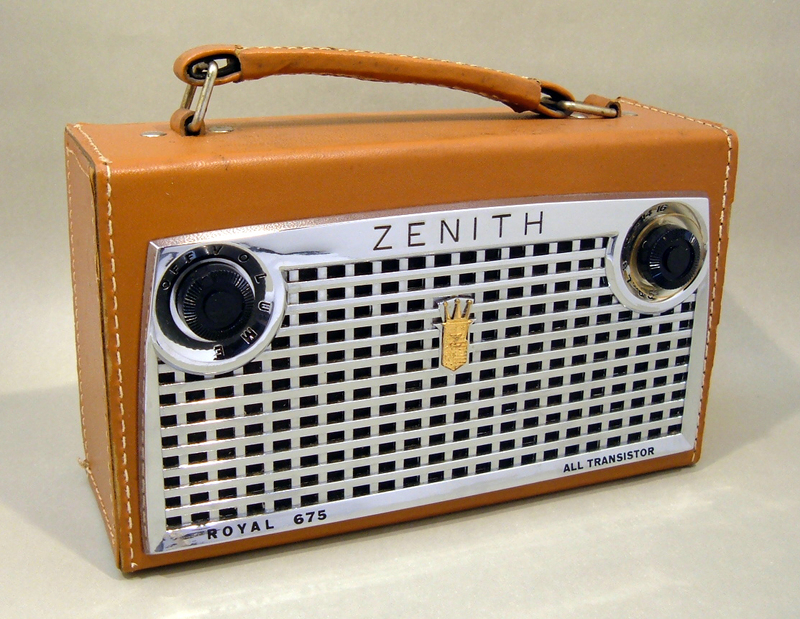 I have a white and brown Zenith Royal Fifteen Eight Transistor Portable Radio that works perfectly and is in amazing physical condition. It came in its black leather carrying case. Sadly, the case is quite brittle and is broken in some places and the carry handle is broken off. I can’t find another Royal 15 after a lengthy search and am wondering what this little beauty is worth. Any idea? I was wondering if you had either a royal 700 or royal 750 for sale or where I could get one in good shape? I would like it to work, but I can always get it repaired. I’m looking to get one for my dad for Christmas. Thanks! Sorry Mike but I am not familiar with that later model. I suggest using eBay if you want to sell it. Cannot find a link to email you directly. Not sure if you collect the 600 series trans oceanic wave magnets, but I have an L600L series in the brown leather from 1954 that is in great working order. I was told that this is a valuable radio. What say you?